note: This tutorial is slightly outdated in that it uses an older version of the XBee green circuit board, and WebbotLib now includes an improved version of the original code written for the Blackfin-Axon integration. The creator of the BlackFin passed away one year ago, but the camera is still being sold. The Blackfin Camera was originally developed for the popular SRV-1 Surveyor robot. Since developing the Axon, SoR and Surveyor Corporation have teamed up to combine our two products to give even a beginner an easy-to-use yet still advanced controller with powerful vision processing capabilities. This tutorial demonstrates how to combine each in both software and hardware. Take your cam out the package, and attach ground and power. You can also just directly connect it to a battery pack (4.8V or 6V will work fine). Whats up with the Blackfin green board, anyway? The main purpose of the green board is to provide the 3.3V supply and give you screw holes for mounting. Although you can also attach a XBee to it, and the newer versions also have the H-bridge for robot motors and switching transistors for the laser pointers. Also, if you want to see an example of how I mounted the Blackfin on my robot, feel free to check out my ERP. Although not required, I recommend you reading my UART tutorial before continuing. It will help you understand this step a bit better. Then we need to attach the same UART cable to the Axon. It doesn't really matter which UART on the Axon you choose, but my included software has it set for UART3. Attach Blackfin TX0 to Axon RX3, and Blackfin RX0 to Axon TX3. It is important that you do NOT attach TX to TX!!! Again, read my UART tutorial to learn more if you are curious/confused. I will now show you how to hook up the Blackfin Camera to a PC for testing. This isn't absolutely required, but will make testing your algorithms significantly easier. First, you need to have your Blackfin directly connected to your PC through the UART. If you are unsure how to do this, please read my UART tutorial. Note: the Blackfin does not come with a cable to directly connect to your PC, you must do that on your own. Now for the software . . .
To view the camera images, download the java-based SRV1Console software. The software is configured at a default 38.4k baudrate, as is the camera when you first receive it. Extract the zip file into a folder, and run the file SRV1Console.exe. A java console should now load up. In the top left dropdown menu, select the port your camera is using, then click Connect. To save you time in the future, you can optionally edit srv.config to change the default from "network" to COM4 or whatever. Currently the Blackfin cam gets 1-2 frames/sec at 160x128 through this console. There's some kind of timeout, so I haven't been able to bump the resolution to 320x256, but this will at least get you started. Other baud options may be available in the future. While still in the terminal mode, send an 'a' command to change resolution to 160x128 (you should receive an '#a' ack) - I believe the console will time out in sending 320x256. To send commands, just make certain that the SRV1Console is the active window, and simply type your commands. Unfortunately, this doesn't display the returned string, but it can simplify testing somewhat. The pySRV1Console does have a command window, but performance isn't as good as the java version. You can also use a terminal program, such as Hyperterminal - just remember you can only have one program at a time access the camera port! And remember to keep all baud rates on all devices the same, or it will not work! For more information on the console, please see the Blackfin console setup page. And a new image will appear. A full Blackfin protocols list can be found on the Blackfin website. Now to install the Axon software for the Blackfin, you need to make three modifications. First, you need to make sure the UART is configured at the proper baud rate. Load up AVR Studio and your software for your robot. Make sure the Blackfin_Axon.c is in your sourcecode directory. By default it should already be there when you downloaded the default Axon source code. 3) Lastly, you just need to make the proper function calls in control.c to send and receive commands/data to and from the Blackfin shown in the next section. Before using any Blackfin commands, you first need to initialize the camera. All this function does is accept firmware version info, sets the resolution, and inserts a short delay so that the camera has time to adjust to the settings. Skip this command unless you plan to write your own functions - you will not normally need to use this command. Whenever you send a command to the camera, it returns a response of some time. What the Echo command does is waits for the response, records the response into the array response[counter] character by character, and returns once the response is completed by the camera. The mean color algorithm finds the average color within an image. This is useful in determining the dominating color, typically background noise, for use with other algorithms. I will give examples of using these values later in this tutorial. 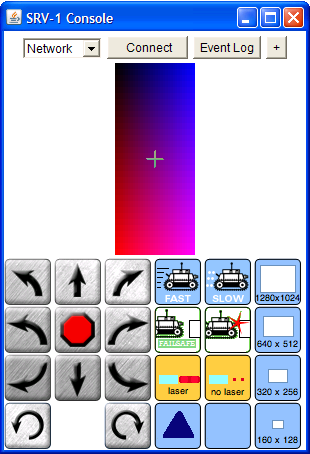 The middle mass algorithm allows your robot to track the center location of a color blob. So logically, the first step would be to first define the colors in the blob. Now fill in the values as you like. We will use bin #0 for the first color (because I said so, silly). Then, using the YUV chart, I selected YUV values to track the color blue. Although hardcoding colors for your robot to track works, its actually a really crude unreliable method. Its very sensitive to environmental changes, isn't as robust, and requires a decent amount of tweaking. Looking at the code, you will see that it is setting the mean value as a threshold. If you think about it for a bit, knowing that the mean color is basically the environment color, you will realize that by doing this you are effectively eliminating half the environment. Now, to eliminate the rest of the environment, you need to add some hard coded tweak values to the mean values. How do you know how big the tweak should be? Well, keep decreasing the color range until the returned number of pixels is small, like less than 200-ish. It greatly depends on the colors of the environment and the tracked object. pixels - Total pixels contained within the blob. This is useful to know in that really small pixel counts could be noise, and really large pixel counts could signal an ill-defined blob. You want the confidence higher than expected noise. I got decent results using a value of 20. As for damping_ratio, I got good results using a value of 13 using the 16MHz Axon microcontroller. The damping ratio is highly dependent on clock speed - faster microcontrollers require higher damping ratios. I calibrated the rotation values using two 180 degree Hitec HS-311 on my Axon microcontroller, so you may need to modify the function code in Blackfin_Axon.c a bit to get it to properly work. I used fuzzy logic as the control algorithm. Other features like edge detection or face detection are being worked on. Like RBG, YUV is a method of representing colors. The Y channel describes Luma (slightly different than Luminance), the range of value between light and dark. Luma is the signal seen by black and white televisions. 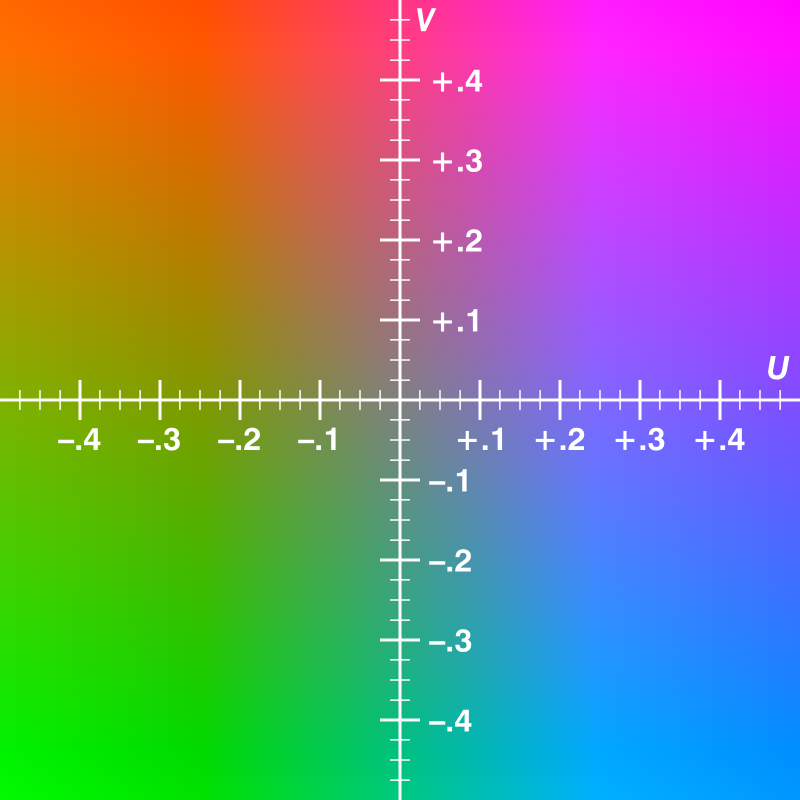 The U (Cb) and V (Cr) channels subtract the Luminance values from Red (U) and Blue (V) to reduce the color information. where -.5 to +.5 is 0 to 255 for the Blackfin camera. But that graph only shows U and V. The third component (shown over time in this below animation) is Y - basically brightness. To learn more, check out YUV at Wikipedia.